In Australia we call it tomato sauce or Dead Horse but it is well known as ketchup or catsup. Finding a sugar free tomato sauce is almost impossible though! Sauce is really the key to so many great dishes. In Australia, a meat pie is close to our national dish (if you didn’t count pavlova and Vegemite on toast), and no meat pie is complete with out tomato sauce. The sweet and slightly sour ketchup matches the earthy meat flavours perfectly, and I am transported to teenage years spent by the beach and getting a few gold coins from Mum to buy lunch. This sugar free tomato sauce captures everything about these memories. Call it what you want, I call it YUM. 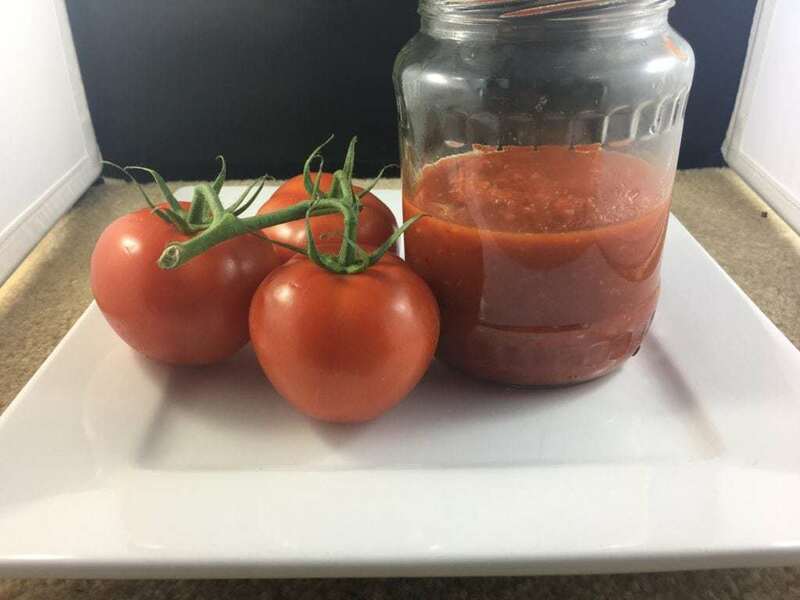 This is my home made sugar free tomato sauce, sugar free, organic, delicious and incredibly versatile. 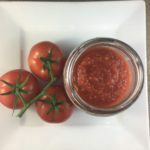 I use this sugar free tomato sauce in a lot of my recipes, and also just day to day if any dish needs a bit of extra flavour. 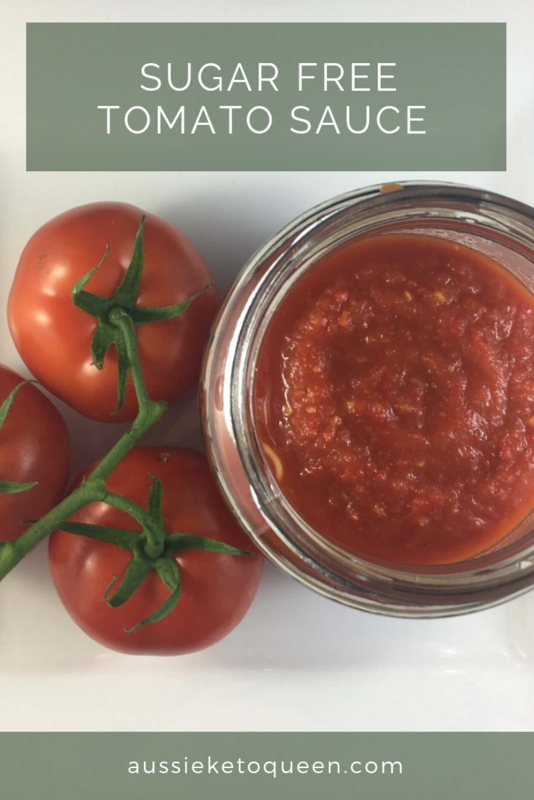 I have a theory that a dish is only as good as it’s sauce, so this sugar free tomato sauce helps me out a lot! It isn’t your traditional overly sweet ketchup but has a great complexity of flavour that we love with just about anything. Especially great with dishes like meatloaf, sausages and on hamburgers. At the bottom is a variation to use some of the tomato sauce and make it into BBQ sauce. Preheat your oven to 200C / 392F and line a large baking tray or roasting dish with baking paper. Remove the top core of the tomatoes and remove the steam and seeds of the capsicum. Cut the capsicum into thirds. Place tomatoes, capsicum, onion and garlic on a roasting tray (you don’t need to peel the onion or garlic) and roast for 30 minutes, or until the capsicum and tomato are split and slightly charred. Leave everything to cool down, and then once you can handle the vegetables, peel the vegetables, retaining any liquid in the bottom of the roasting tray. Combine vegetables, roasting liquid, and all other remaining ingredients in a food processor and blend thoroughly. Move to a saucepan and simmer over low heat for 30 minutes, stirring occasionally. Pour into sterilised jars or bottles. I find this usually lasts at least a couple of months in the refrigerator. Using some of the tomato sauce, you can create a delicious smokey BBQ sauce as well! Combine all ingredients in a saucepan and simmer over low heat for 5 minutes, until all combined. If it is a bit thick for your liking, add some water a tablespoon at a time until you are happy with the consistency. What are the macros for the serving size? Is it a tsp? A tablespoon? And what’s a capsicum? For things like sauces, the serving size is approximate. For this particular recipe I have stated 30 serves, so this would be about a tablespoon per serving. If you need to get super specific you would need to weigh the final product and divide by 30.